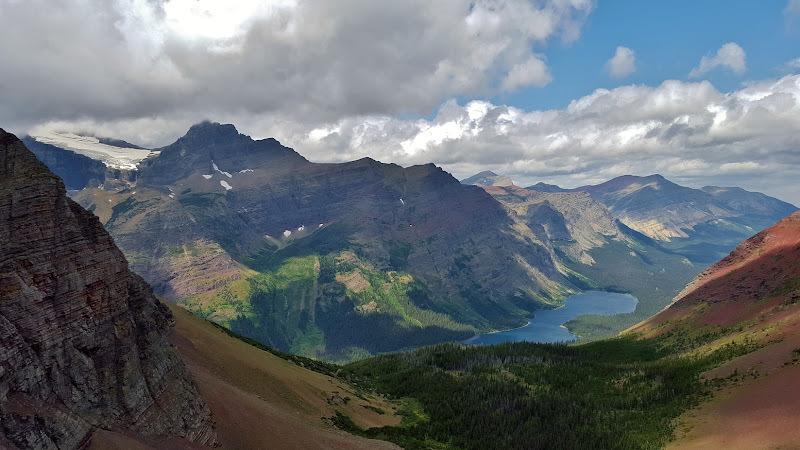 Glacier National Park Trip - Take a Hike! The last week of July, we went to Glacier National Park in Montana for a week of hiking and exploring. We flew out of RDU early Saturday morning. Somewhere along the way, Chris lost his ID. Fortunately, TSA allowed him to board with just his firefighter ID and a Costco card. For the rest of the trip, his trail name was Costco. We had a layover in Minneapolis and arrived in Missoula around 11 AM Mountain Time. Justine and Dan got rental cars and we stopped at Quiznos for lunch, before driving north. It was a good 2.5 hours from Missoula to Glacier, but it was a scenic drive in the mountains. 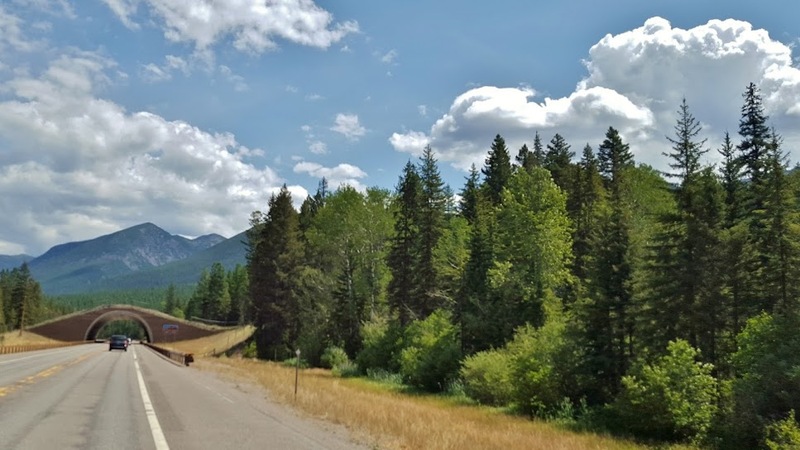 We stopped once at an overlook for Flathead Lake on the way. In Kalispell, we picked up Betsy, Steve, and Laura at Glacier Park airport and then headed to Hungry Horse, where our rental house was. It was a cute little house, with enough beds and bunk beds for all ten of us. Sandy and I, as the only married couple, got the upstairs master bedroom. It was nice and comfortable, but the ceilings were kind of low and hit my head on them throughout the week. But I had a nice desk area to set up my computer to dump pictures and video after each day. I certainly took enough! After unpacking, we headed to the West Glacier entrance to the park and bought our passes for the week and got some bear spray. Then we had dinner at Elkhorn Grill, which was a little disappointing. It looked like a nice hole-in-the-wall place, but the food was no better than fast food. After dinner, we went to the grocery store to pick up food and other supplies for the week. 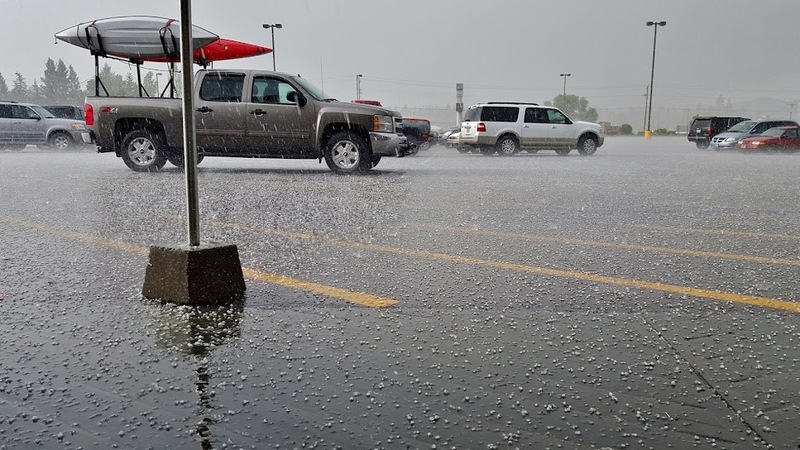 While inside, a big hail storm hit the area. Fortunately, we were safely inside, but it was amazing to watch. The small chunks of ice didn't last long in the warm summer weather. After we settled in at our home for the week, I went for a short walk around Martin City to stretch my legs, and then we retired for the evening. Sunday morning, we woke up very early to leave the house at around 630. So early, in fact, that a deer was grazing in the backyard as we were getting ready to leave. She was surprised to see people up at this time! It was a long drive over to the Many Glacier area of the park. The Going to the Sun Road was closed due to the Reynolds Creek Fire, so we drove US-2 around the park and then headed north on MT-49 and US-89. We stopped at an overlook on US-89 near the Cut Bank entrance to the park for a couple pictures and the chance to stretch our legs. We stopped at another one further up where some horses and cows were grazing in the overlook. We arrived at Many Glacier around 930 and started our hike on the Ptarmigan/Iceberg Lake Trail. The trail starts along an open area with fantastic views of the glacier-carved mountains all around. The mountains were mostly clear of trees and so wildflowers along the slopes were exploding in color. We had great views of Grinnell Point and Mount Wilbur. The sky was cloudy and many of the mountain peaks were hidden by clouds. In about 2.5 miles, we passed Ptarmigan Falls, though there was no good view of the waterfall from the trail due to dense vegetation. There didn’t appear to be any easy way to get a good view, so I would have to get creative to get a nice photo. I decided to try this on the way back. We stopped near the top of the falls for a snack break. While we were eating, several Columbian ground squirrels came out. Clearly, they were used to seeing people and looking for any scraps of human food to eat. After lunch, we crossed the creek and came to a split in the trail, where we turned right to head upstream along Ptarmigan Creek. The trail was a little steep, steadily heading upstream along the creek. It had started to rain, but it was just a light drizzle. All along the trail, the wildflowers were exploding in a rainbow of colors, so we hardly noticed the rain or steep incline. Fireweed, asters, and Indian paintbrush were in full bloom along much of the trail. In about 2 miles, we reached Ptarmigan Lake, the first of many gorgeous mountain lakes we would see this week. From here, the trail steeply climbed up to Ptarmigan Tunnel via a couple of switchbacks. It was a little cold and quite windy heading up, so I hiked quickly to the tunnel and had lunch inside, shielded from the wind behnd the door. After lunch, I headed to the other side of the tunnel and right away, we saw some bighorn sheep. Initially, they were right on the trail, but when they spotted people, they climbed up the cliff face. It was a small herd of females and juveniles, so their horns weren’t as impressive as a male’s. We walked a short ways past the tunnel, with nice views of Elizabeth Lake far below and Old Sun Glacier high on the mountains above. A waterfall flowed out from in under the glacier. As we were heading back to the tunnel, a large hoary marmot came out and posed for some pictures. He seemed to be just fine around people, but then got spooked and started climbing up the cliff face. I was amazed watching him climb – he rock-climbed just like a human. Looking back and forth, he sought out hand holds and foot holds to boost himself up the rocks, then shimmied into a crack and climbed further up. We also saw a great big snow bank near the tunnel entrance. After such a hot summer in NC, it was nice to see snow in July! Just before we headed back into the tunnel, a golden-mantled ground squirrel popped out. This area was a really great spot to view wildlife! We then headed back through the tunnel and down the switchbacks to Ptarmigan Lake. On the way down, we saw the herd of bighorn sheep, who had climbed over the tunnel and were no high up on Ptarmigan Wall. Heading down towards Ptarmigan Lake, it was noticeably warmer down here than up by the tunnel. From here, we backtracked towards Ptarmigan Falls and turned right to get on Iceberg Lake Trail. The hike was along an open ridge with great views of the surrounding mountains and the wildflowers were in full bloom. There was even a waterfall on the creek flowing out of Iceberg Lake, but it was too far away for a good picture. As we approached Iceberg Lake, we hiked through a gorgeous wildflower meadow before the final leg of the hike, where we could see the lake. From up here, we could see the icebergs on far side of the lake. We hiked down to the lake, but unfortunately, all the icebergs were on the other side and we didn't have as good of views. When the icebergs are more plentiful, it’s possible to stand on them, but not today. I did take off my shoes and wade into the chilly waters, but it was too cold to go more than ankle deep. After we were here for a while, a large group of high school students from Michigan arrived. They were actually brave (or stupid) enough to go all the way in, but that looked way too cold for me. Once in the water, they didn’t stay under long. After enjoying the beautiful lake for a while, we started making our way back. When we got back to Ptarmigan Falls, I scrambled down the path for a better view of the waterfall. It was very steep, but I managed to get in a position for a decent shot of the waterfall. Then I climbed back up and we continued hiking back to the parking lot. About half-way back to the parking lot from here, we spotted a moose grazing far below. He was too far to get a good picture, but we were excited for our first moose sighting. Then we finished up the hike to the parking lot. We decided to get dinner on the way back and stopped at Serrano’s Mexican in East Glacier. It came highly recommended, though I can’t figure out why. On the way out of the park, a bunch of cars were pulled over, so we stopped too. A black bear was rummaging around just up from the road along the base of Altyn Peak. Once out of the park, we called ahead to Serrano's as it was a big party, but still had to wait at least 30 minutes for a table. Once we finally got a table, we had to wait over an hour for our food. The waitress was not apologetic at all, I guess knowing she would get the automatic gratuity. The entire restaurant had cleared out and they were closing before they finally bothered to bring our food, which was mediocre at best. We were just glad to get out of there at that point. It was another hour or so to get back to the house in Hungry Horse and we were exhausted by the time we got back. We slept in a bit in the morning and headed out in the late morning for a shorter drive. We headed into the park from the West Glacier side and drove Going-to-the-Sun Road to Avalanche Creek Trailhead. As we’d gotten a late start, the parking lot was full and we had to drive another mile up the road to park at Red Rock Point. I headed down to McDonald Creek and got some pictures here - the water was a most beautiful turquoise color. Then we walked the road to the trailhead and started off on Trail of the Cedars through a forest with some immense cedar and hemlock trees. This forest reminded me of the Pacific Northwest. Then we got on Avalanche Creek Trail and started heading up the trail. Shortly, there were some small waterfalls along the creek, flowing through some cool rock formations. There were several large rocks wedged into the gorge. We stopped for pictures, then continued up the trail. This trail is relatively short and easy and so it was very popular, even in a light rain. In about 2 miles, we reached Avalanche Lake, which has at least three very tall waterfalls flowing down from Sperry Glacier into the lake. I don’t think there’s any way to get closer, but they were quite impressive even from across the lake. Monument Falls is the only that is named on the topo map - I believe that it is the one furthest to the left. We ate lunch here sheltered under some trees from the rain, which started to pick up. So after lunch and some pictures, we headed back. Next, we continued up Going to the Sun Road, going as far as we could with the road closure due to the Reynolds Creek Fire. Past the loop, we stopped at several overlooks with views of the McDonald Creek Valley and Bird Woman Falls. At nearly 500 feet, Bird Woman Falls is one of the highest in the park, but it can only be viewed from the overlooks, about 2 miles away. Although I couldn’t get a close-up shot of the falls, the views were great, especially with the wildflowers blooming along the road. At the Bird Woman Falls Overlook, we could also see Haystack Falls, with Going-to-the-Sun Road passing right across the middle of it. Unfortunately, the water level was low and so the falls was just a trickle. Heaven’s Peak was also visible, partially hidden by clouds. We drove as far as Big Bend, where the road was currently closed and made a stop for pictures. Then we started driving back. We made one stop at the Loop for more views of Heaven’s Peak, then continued on towards Lake McDonald. At the head of McDonald Lake, we turned right onto a road that crosses the creek right where it feeds into the lake. Looking upstream, we could see the waterfall. We parked a little past here, then hiked McDonald Creek Trail to the waterfall. The trail comes out near the top of the falls, but I was able to find a way to climb down some steep rocks to the base of the falls. The falls were quite powerful and had a beautiful turquoise color, mixed in with the crashing whitewater. There were a lot of really pretty stones in the creek here as well. I climbed back up and then we headed back to the car. We stopped at Apgar Village to buy souvenirs and I got some pictures of McDonald Lake. We decided to just eat here at Eddie’s Café. This was the best food and service we’d had yet on the trip. Sandy had a glass of Huckleberry Riesling with dinner. We liked it so much, that we got two bottles from the gift shop after dinner. After dinner, we headed back to the house and got to bed early. Tuesday, we had another long drive to Many Glacier, leaving very early in the morning. 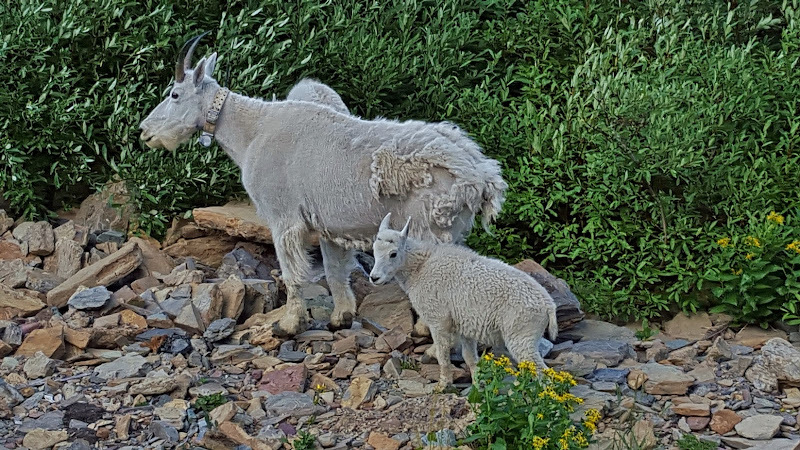 Along the way, we stopped at Goat Lick Overlook to see the mountain goats. There were three mountain goats here that we could see, including a little kid, but they were too far away for a good picture. From here, we continued the rest of the way to Many Glacier and first stopped at the trailhead for Apikuni Falls, just past Lake Sherburne. This was our warm-up hike - it’s less than a mile to the waterfall, but fairly steep. From the trailhead, we could see up into the Apikuni Creek Gorge where the creek flows down from Apikuni Mountain, but the falls were not visible. Although the trail was rather steep, there were nice views of Altyn Peak and the surrounding mountains. As we approached the end of the trail, Apikuni Falls became visible. The waterfall is nearly 150 feet and really beautiful. We could even see a small rainbow near the base. And the rocks all around the falls are a brilliant orange color. We spent some time here, enjoying the falls and then started making our way back. I stopped near the top for some pictures of dead trees standing up – a testament to the difficulty of living in such conditions. Once back at the cars, we made a short drive to the trailhead for our main hike of the day – Grinnell Glacier. The parking lot was full and we had to park on the road. This trail is popular and for good reason – it’s absolutely beautiful, my favorite hike of the trip. The trail begins heading around the west side of Swiftcurrent Lake. Across the lake, we could see the beautiful Many Glacier Hotel. After Swiftcurrent Lake, we walked along the west side of Lake Josephine. The boat dock was across the lake and a few times, we saw the tour boat cruising across. On the far side of the lake, we could see some tall waterfalls tumbling down into the lake. Once past Lake Josephine, the trail started to get steep - nothing too difficult and the beautiful scenery was a pleasant distraction. There was no shortage of stops for photos along the hike. At one point, we stopped for a snack where several other people were resting. We talked to two ladies who were the wife and mother-in-law of the boat captain at Two Medicine, who we would be seeing the following day. From here, we had great views of Grinnell Lake and Grinnell Falls flowing into it. This was the prettiest lake yet, a beautiful shade of blue. As the wind blew across the surface, the color changed in wild kaleidoscope patterns. The trail started to get more crowded from this point on. There was a good number of folks coming back as well as people going in the same direction as us. I tended to pass the people, then they would pass me when I stopped to take pictures. And I stopped a lot. The wildflowers were blooming here and the views of the lake and waterfall were so gorgeous for a couple miles along the trail. At one point, we passed a weeping wall, where water was trickling down the wall onto stairs on the trail. We also saw a mother Columbian ground squirrel and one of her young. She was calling out, presumably to locate her other baby. We also saw a bighorn ram far below grazing. He had a very impressive set of horns. Near the end, we passed the group of teenagers from Michigan that we had seen at Iceberg Lake. They told us the water here was too cold even for them. As we approached Grinnell Glacier, I looked back and could see many of the lake we had hiked past on our way up - Grinnell Lake, Lake Josephine, and Sherburne Lake. Once near the top of Grinnell Falls, the trail headed up via switchbacks, perhaps the steepest part of the trail. But once at the top, we could see Upper Grinnell Lake, certainly one of the most beautiful places in the world. I headed down to the lake’s shore and indeed, the water was incredibly cold. There was no way I was getting in, even for a moment. I contemplated it though – the icebergs were near the shore and if I could have handled the cold, I probably could have climbed onto an iceberg. But the water looked a lot deeper – after all, even the dumb high school kids didn’t get in. Across the lake, we could see Grinnell Glacier to the left and Salamander Glacier high up and in the middle. Salamander Falls flowed down from the glacier into the lake. The water was such a beautiful color and there were many icebergs floating in the lake. I really enjoyed this hike – we hiked past four lakes, each more beautiful than the last. We spent some time here enjoying the magnificent glaciers that unfortunately, may not exist much longer. Once finished, we started making our way back. The views were just as great hiking back. Hiking past Angel Wing, I could picture the massive glacier carving this mountain into its current shape. It started to drizzle around the time we got back to Josephine Lake, but just lightly. It never really rained hard and we saw a beautiful rainbow across the lake. The weather had cleared up by the time we got back to the parking lot and we headed to the Many Glacier area for dinner. The pizzeria next to the motel turned out to be pretty good. Our dining experiences were much better at restaurants in the park than those outside. The pizza was good and I tried a Huckleberry beer, which was very tasty. So much so that Sandy, who rarely drinks beer, had one too. After dinner, we made the long drive home from Many Glacier one more time. On the way out, we stopped again at a traffic jam. There was another bear on the hill just above the road. This one was a mama bear with her cub. They scavenged around for food for a bit then disappeared into the woods. Once outside the park, we stopped to see the Reynolds Creek Fire. After this point, it was starting to get dark, so we finished the drive back to Hungry Horse and went to bed immediately. Wednesday, we left the house a little later. We were only driving to Two Medicine and our boat ride wasn’t until 1030. Unfortunately, there was construction on US-2 just before East Glacier that slowed things down, but we made it to Two Medicine in time. After getting our tickets for the boat ride, we enjoyed the view of Two Medicine Lake and the beautiful Sinopah Mountain across the lake. At 1030, we boarded the boat and set off across the lake. The mountains surrounding the lake were beautiful and a ranger accompanied the tour to give us some information about the natural history of the area. The lake isn't real big so we crossed in about 15 minutes. At the other side of the lake, we set off on our hike. We took a short spur trail to Two Medicine South Shore Trail and went straight to the end of this trail at Upper Two Medicine Lake Trail. Turning left here, it was just a short ways to Twin Falls. As the name implies, there are two distinct waterfalls. An unnamed tributary of Two Medicine Creek splits above the waterfall into two distinct streams that come back together after the waterfall. It was hard to get a good shot showing both waterfalls, but each one individually was quite nice. The left side has more water flow, while the right side was higher. We had to rock hop across to get to the base of the one on the right, where we played in the water and climbed around next to the falls. The rocks next to the falls formed stairs that made it easy to climb up the right side of the waterfall. As we were getting ready to leave, a Satyr Comma butterfly landed on Dan. After it flew off, we hiked the rest of the trail up to Upper Two Medicine Lake and had lunch here. At first, it was breezy and a nice place to eat. Then, the breeze died down and a huge number of flies came out so we finished lunch quickly and started backtracking. When we got near the boat dock, we turned right to get on South Shore Trail and hike around the lake. At the next intersection, we turned right to get on Two Medicine Pass Trail towards Cobalt Lake and hiked about a mile to Rockwell Falls. Approaching the falls, we could see the bottom portion, a 15-foot drop. It was scenic, but looking up, I could see there was more waterfall, so I crossed the creek and climbed up to the next section. At this point there are two distinct falls, just before the creek does an abrupt 90° turn. Climbing out onto the rocks on the corner, I could kind of see the two waterfalls, but not a great view. So I took off my boots and waded into the cold water for a much better view. I could also see that there was more waterfall further up. So after drying my feet, I continued up for a better view of the different falls and some smaller cascades up at the top. 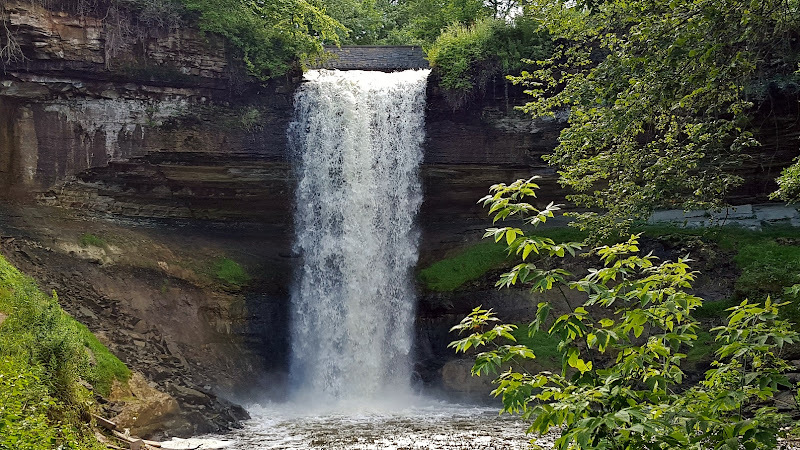 Rockwell Falls is a really cool waterfall and worth the time to explore – there’s a lot to see! There were more cascades and cool rocks around the falls as we kept going up. Eventually, there was no more waterfall further up, so we headed down and started backtracking to South Shore Trail. We turned right and continued following the south shore of the lake. A few people on the trail indicated they had seen a moose, but we didn’t have any luck finding him. There was a rickety suspension bridge to cross the creek, and then the rest of the trail was mostly flat. About a mile and a half or so from the bridge, we made a quick detour to see Aster Falls. It’s a thin cascading waterfall. After some pictures at the base, I climbed up the right side to get some pictures of the upper cascades as well as the view looking back from here. When we got back to the intersection with South Shore Trail, some people told us that they had seen the moose again. We were determined to see him, so we backtracked about a mile and eventually saw some people just off the trail. The enormous bull moose was foraging in the shallow waters of a small pond along Paradise Creek. He would stick his head underwater for a few seconds, then come up for air and chew his food before going back down. A few times, he vigorously shook the water off after coming up for air. His rack was huge. One time when he came up, he was right next to a tree and his antlers ripped and shredded the branches off the trail without seeming to even faze him. We enjoyed watching him for a while then made our way back to the boat dock parking area. Everyone was tired, but Justine, Sandy, Betsy and I wanted to get one more waterfall, so on the way out, we stopped at Running Eagle Falls. It’s only a short, handicapped-accessible trail to this interesting waterfall. The water level was low, so only the lower 20-foot cascades part of the falls was flowing. In higher water level, a second 40-foot waterfall crashes down in front of the lower one. Hence, this waterfall is also called Trick Falls. But even with just the lower part, it’s a really interesting waterfall. The water comes down from inside the rock and appears to be flowing out of nowhere. We got some pictures and enjoyed looking around at all the pretty rocks in the creek bed, then started making our way home. We stopped at Firebrands along US-2 on the way home. While we were waiting for our food, we talked to a fairly intoxicated local who was a veteran and had been stationed at Fort Bragg, so he was familiar with North Carolina. After dinner, we made our last long drive home along US-2. Thursday morning, most of the group woke up and left at 5 to hike the Swiftcurrent Pass Trail, but I wasn’t feeling great and wanted to sleep in a bit. So Sandy and I headed to McDonald Lodge a little later in the morning to hike to Sperry Chalet. We parked at the lodge and started our hike around 930. Before we left the parking lot, we met an older gentleman named Jack, who was also hiking up to Sperry Chalet. He joined us for our hike and we enjoyed talking with him along the trail. Good conversation made the rather steep trail a little better. Heading up Gunsight Pass Trail, it was mostly forested, but a couple places to pop out and see the Snyder Creek Valley and Lake McDonald in the distance. In just under two miles, we crossed Snyder Creek and continued on Gunsight Pass Trail up towards the chalet heading into the Sprague Creek Valley. The trail was steep and steadily increasing, but we had started early enough that it wasn’t too bad. Most of the way was in the shade at least. In another couple of miles the trail started to open up and soon we passed Beaver Medicine Falls, an impressive looking waterfall, but it was too far from the trail for a good view. Shortly after passing the falls, we could see Sperry Chalet from the trail high on the cliff above. At one point, we had to stop and get off the trail to allow a mule train coming down the mountain after delivering supplies to the chalet. There are no roads up to the chalet so all goods must be carried up by mules. We were fortunate to be on the trail when they passed. Finally, the trail started to level off as we approached Glacier Basin. From the footbridge over Sprague Creek, we could see Akaiyan Falls in the distance. Hiking a little further, we could see Feather Woman Falls, a beautiful waterfall tumbling down in two streams. In higher water, there are even more streams to this falls. We made the final ascent up to the chalet and stopped in for lunch. They have a limited menu, so we got sandwiches and a pitcher of lemonade. I don’t think lemonade has ever tasted so refreshing! We finished the entire pitcher and refilled our water from the chalet. After lunch, we headed outside and enjoyed the view from here. Lake McDonald was visible far below. Then we started making our way back down. We spotted a patch of Lewis' Monkeyflower blooming near Glacier Basin. A little further down the trail, we saw a cute little golden-mantled ground squirrel digging a hole right along the trail. When we passed Beaver Medicine Falls, I tried a couple times to bushwhack to a better view of the falls, but had no luck. The area is incredibly steep and overgrown with impassable cliff faces blocking any chance of getting to a good view. I got as close as I could to get a picture and decided to turn back. Once I gave up, we continued making our way back down. It was easier going downhill, but it was much hotter than it had been in the morning and there was a much less shade along the trail. Right before we reached the bridge over Snyder Creek, Sandy thought she saw a waterfall. Hoping for better luck on this one, I got off the trail and bushwhacked to this small unnamed waterfall for a couple of pictures. Then we finished our hike back to the parking lot at McDonald Lodge and said good-bye to Jack. Looking across the street, we could see Mount Brown and the lookout tower far above. We had passed by the extremely steep trail that leads up there. We swung by the gift shop at the lodge for a few minutes and I got some pictures outside of the totem pole as well as the “jammer” buses that provide tours. Then we headed back to the house. Everyone else had returned already from their hike and since it was much earlier than previous days, we cooked a big group dinner together. Friday was out last day in the park. Going to the Sun Road had opened to Logan Pass and the Highline Trail was now open, so we were excited to be able to do this epic hike before our trip was over. We arrived at the Loop shortly after 7, planning to take the shuttle to Logan Pass and hike back to the cars. Unfortunately, most of the shuttles were full or had limited seating. 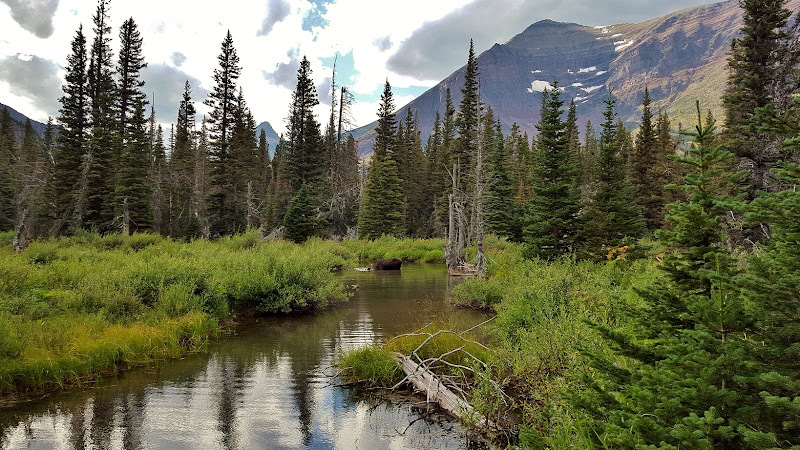 The recent reopening of Logan Pass had greatly increased the crowds. We finally got four people on a shuttle, then drove the rest of us in the van to Logan Pass. After getting our stuff together, we set off on our hike. 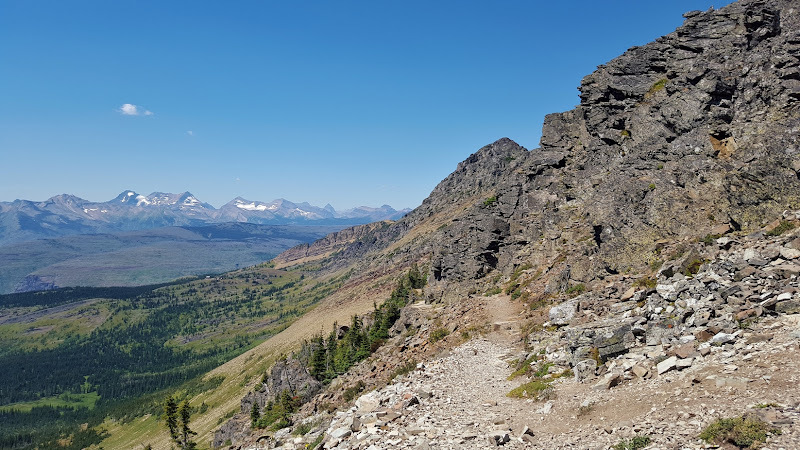 The Highline Trail is certainly one of the most spectacular trails in the park, running roughly parallel to and high above Going to the Sun Road right below the continental divide. The views over the mountains, bathed in early morning light, were fantastic. We could see Clements Mountain and Mount Oberlin clearly as we started the hike. This is a popular trail, however, so there were a lot of other people on the trail. At one point, the trail narrowly circumnavigated a steep cliff wall, with just a garden hose attached to the cliff for a hand rail. In about 2 miles, we stopped at a rocky open area for a snack. We were soon greeted by several Columbian ground squirrels, who came out of the rocks, looking for a bite to eat. Continuing on, we could see Lake McDonald and the McDonald Creek Valley, Heaven’s Peak, and several other features of the park. Heaven’s Peak was visible for nearly the entire hike. Along the Garden Wall, wildflowers were blooming all along the trail in a rainbow of colors. Just off the trail, we saw a spruce grouse pecking around in the brush along the trail. As we continued along the Garden Wall, we could see Granite Park Chalet in the distance. Before we made it here, we came to a split in the trail and turned right on Garden Wall Trail to head up to the Grinnell Glacier Overlook. Gaining over 1000 vertical feet in less than a mile, this is the steepest trail in the park. But so worth it. Going slow and steady, the climb wasn’t too bad, and soon we reached the top where we had an amazing view of Grinnell Glacier and Upper Grinnell Lake from far above. We stopped to have lunch here and then spent some time taking pictures from this phenomenal overlook. From here, we could see the four lakes that we had passed on our Grinnell Glacier Hike – Upper Grinnell, Grinnell, Josephine, and Sherburne. Looking down far below, we could see where we had hiked up to the edge of the glacier and lake. On the other side of the mountain, we could see the smoke from the Reynolds Creek Fire, which had unfortunately picked up a bit in the last day or two. As we were getting ready to head back down, we spotted a mountain goat far below on Salamander Glacier. Then, we started making our way back down to the Highline Trail. There were more beautiful wildflowers blooming along this last stretch before Granite Park Chalet. Shortly after getting back on Highline Trail, we spotted a large bear up above. He was digging at an old log, presumably eating ants or termites. We initially thought he was a grizzly, but after looking at the pictures closely, I think he was a brown black bear. After getting some pictures from a safe distance, we continued on to Granite Park Chalet. This chalet does not have running water nor lemonade, but we were able to purchase some cold bottled water. From here, we just had to hike back down to the Loop. Since we had to pick up the other car back at Logan Pass, Sandy, Dan and I hiked very quickly back to the parking lot while the others could take their time. We made the four-mile hike in just over an hour and drove up to Logan Pass Visitor Center. We had hoped to get some cold drinks at the gift shop, but it was already closed, so I filled up some water bottles from the drinking fountain. We had passed the roadside Oberlin Falls just before Logan Pass and I wanted to stop quickly for a picture. As we were driving to it, we had to stop as several mountain goats were in the road. As the goats got off the road, we drove past slowly to get some great pictures of these beautiful creatures. It was two adults and three kids, grazing along the side of the road and hopping back and forth across the stream below the waterfall. I was so excited we got to see some mountain goats up close. Watching their climbing skills is always so amazing. After some pictures, we drove back to the Loop just as the others were finishing up the hike. We got everyone back in the car and then headed to Apgar for dinner at Eddie’s again. After dinner, we headed back to the house and got our stuff packed to head home after a wonderful time in beautiful Glacier National Park. Saturday morning, we finished packing and left the house around 730. We dropped Betsy, Laura, and Steve off at Glacier International Airport and then drove to Missoula. After clearing security, I got a huckleberry scone for a snack before boarding the plane. It would be my last time eating huckleberries for a while. Our first flight to Minneapolis was on time and our layover was 3 hours. I didn’t want to just hang out in the airport, so Sandy and I got a taxi and went to Minnehaha Regional Park, part of Mississippi National River & Recreation Area to get one last waterfall. The taxi dropped us off in the park about a mile from Minnehaha Falls. We hiked quickly and got a couple of pictures of this impressive waterfall before hiking back quickly.